The AM03 transmitter is no longer available. I received the following message from Geoff. My reason for contacting you is to tell you that I shall be unable to continue with the AM03. I have found that the coil that I use has become obsolete. This is probably due to the forthcoming RoHS directive that will also make a redesign of the unit necessary and financially unrealistic. I would like to thank you for including it on your website for so long. Unlike the other units reviewed here, the AM03 is supplied as an assembled PCB only - you provide the power supply (four AA batteries works well, or a regulated power adaptor), audio connections, aerial (3 metres of wire), case etc. It is manufactured and supplied by Geoff Hopkins and costs £19.80 plus £1.50 postage and packing. Geoff also attends the NVCF and most BVWS Harpenden swapmeets. Since the unit is supplied as an assembled board, the circuit diagram is not published. It is a conventional analogue design using four transistors. The oscillator is a single transistor LC circuit. The capacitor is variable, giving a frequency range of 800kHz to 1500kHz approx. The unit accepts audio input from the line output or earphone socket of any audio equipment (mono or stereo - the latter being mixed to mono). A preset on the board sets the audio level (and hence the modulation level). The audio input is amplified and buffered by a single transistor, to drive the modulator circuit which uses a third transistor. The RF output from the modulator is buffered by the fourth transistor. 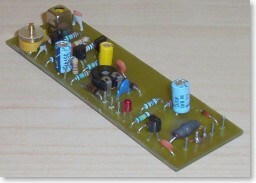 A fixed LC filter circuit prevents harmonics reaching the antenna. The unit requires 6V DC at a few tens of mA. It is a straightforward design and works very well. The analogue tuning adjustment makes it easy to set up (just find a quiet patch on the top half of MW and adjust the preset cap to tune it in). The frequency varies slightly with supply voltage (e.g. as the batteries run down) but this isn't significant. The audio quality is excellent. Because there is no frequency response limiting, the quality can exceed that of transmitted AM broadcasts. The range is acceptable although lower than the other units reviewed here. With a three metre antenna wire, good reception is obtained in the same room and part-way into adjacent rooms. The instruction leaflet includes the design of a frame antenna comprising 29 turns around a 7" by 5" plastic lunch-box, with a trimmer capacitor to peak the tuning. Geoff tells me that this gives a considerable improvement in range, but I have not had an opportunity to try it yet. You could perhaps house the transmitter board and batteries inside the case, making a neat self-contained unit. There is clearly room for experimentation here. If you are looking for a low-cost unit, and are happy to sort out the power supply arrangements and casing etc, I can recommend the AM03. 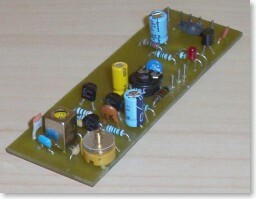 It is an excellent low-cost building block to make your own transmitter system. The only real drawback is the rather limited range, but it is likely that the frame antenna design would solve this for virtually no cost. The AM-03 is no longer available. Please see the note at the top of this page.